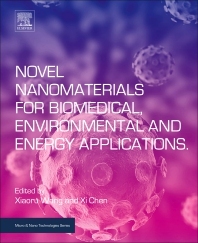 Novel Nanomaterials for Biomedical, Environmental, and Energy Applications is a comprehensive study on the cutting-edge progress in the synthesis and characterization of novel nanomaterials and their subsequent advances and uses in biomedical, environmental and energy applications. Covering novel concepts and key points of interest, this book explores the frontier applications of nanomaterials. Chapters discuss the overall progress of novel nanomaterial applications in the biomedical, environmental and energy fields, introduce the synthesis, characterization, properties and applications of novel nanomaterials, discuss biomedical applications, and cover the electrocatalytical and photothermal effects of novel nanomaterials for efficient energy applications. The book will be invaluable to academic researchers and biomedical clinicians working with nanomaterials. Professor Xiaoru Wang is currently President and Professor in the Department of Environmental Research at Xiamen Huaxia University, China. She obtained her Ph.D. at Department of Chemistry, University of Massachusetts, USA. Professor Wang’s expertise is in the application of nanomaterials to the environment and she has published over 300 scientiﬁc research articles in archival scientiﬁc journals. Professor Xi Chen is a full Professor in the Department of Chemistry at Xiamen University, China. He received his Ph.D. (1996) in Analytical Chemistry from the Kyoto Institute of Technology, Japan. Dr. Chen’s research interests cover nano materials in electroanalytical chemistry, bio-chemical sensors and solid-phase microextraction. He has published over 250 scientiﬁc research articles in archival scientiﬁc journals.